Take a moment to imagine a place with great company, entertainment, and food. Students and members of the community gathered for the Intercultural Festival. Photo Courtesy of Bailey Smith. Take a moment to imagine a place with great company, entertainment, and food. That is the 2017 Intercultural Festival summed up into words. 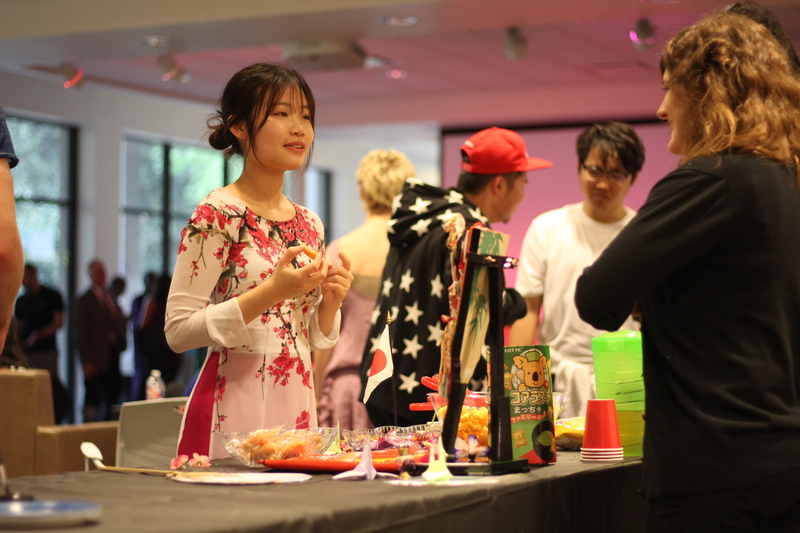 On Monday, March 27, Millsaps College hosted an Intercultural Festival based on the theme “love over borders.” The Leggett Living room embodied the definition of love, complete with peers and community friends meshing their cultures through food, fashion, and performances. Vajresh Balaji, event chair and freshman applied mathematics major, said the event took a great bit of work, but he was thoroughly pleased with the outcome. The event opened with two musical pieces, “What a Wonderful World” by Louis Armstrong and “I Wish” by Stevie Wonder, sung by Daniel Coleman, a sophomore sociology major. Following that, Ezekiel Yang, a religious studies major, and his friend performed a dance number that combined pop and hip hop. Leah Whitcomb, a senior communications studies major and digital arts minor, showed a film on the Black Lives Matter movement that featured those who have been victims of police brutality names spilling out of a black box. Additionally, Adonia Goshu, a freshman, gave a presentation on her home country of Ethiopia. Her presentation gave many facts about the culture there, and afterwards, she showed a music video that encompassed much of what she had previously portrayed. In all, about 10 countries were represented at the intercultural festival. To close out the event, many students participated in the fashion show, which showcased fashions from bright and colorful dashikis to Japanese-inspired kimonos. All throughout the performances, students were able to visit the different tables and grab a bite to eat from dishes of that particular country and also learn some facts about that country. Some students opted to get henna tattoos, while others sat and chatted with their friends. Coleman enjoyed the atmosphere and realized the importance of sharing each other’s culture. “My favorite part was the family atmosphere even though the purpose was to distinguish all of our different cultures. The festival really reassured that we all adopt certain characteristics from each other and that’s what makes us all unique,” Coleman said. Keancelar Birge, a freshman, loved the different styles presented in the festival. Kelli May, a freshman biology major had high regards for both the food and the talents that were displayed. The Intercultural Festival accomplished the task of allowing individuals to get a glimpse into the life of others. Shoutout to Millsaps for being a truly accepting and diverse place.